Leanne Albers draws from a lifetime of experience around horses – in fact, she was riding before she could even walk. Growing up on her parents’ farm, Leanne spent all of her free time at the barn with the horses. Leanne now loves passing on knowledge to other riders. 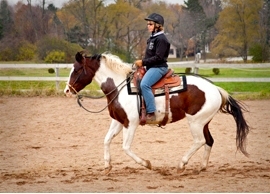 Leanne Albers has 16 years of experience as a riding instructor. As a teacher, she applies the fundamentals of dressage and horsemanship to achieve harmony and balance between horse and rider. All lessons with Leanne are goal-oriented based on the needs of your horse and you. No matter your goals, Leanne will set up a lesson structure that will help you make progress and learn. Not only will you improve your riding skills and knowledge of the horse, but you will establish confidence in your abilities that you can apply outside your lessons. A large part of Leanne’s lesson program teaches independence and decision making, so you can use your awareness of your horse to make smart, safe choices, both in and out of your lessons. Rosanne has been a student of the horse her entire life. She is continually searching for better ways to help the horse and rider become more balanced. Rosanne has taken many instructor courses and is now enrolled in the Mastery Course of Straightness Training, JPC Horsemanship Simplified, Dressage Naturally and Developing Balance in Hand Course. Rosanne's goal is to help the adult rider become more confident in their skills while helping their horses become more supple physically as well as mentally. Rosanne understands that every student is at a different phase in their journey and has a different destination. By helping the student understand core fundamentals of horsemanship, she is able to help the horse and rider team build a solid foundation for whatever direction they wish to pursue. Don is affectionately called the "Horse Whisperer" at the barn. Don has a wonderful way of handling and communicating with horses so that a difficult to control animal becomes calm and responsive. He has a passion to do right is right for the horse and helps their owners find out what that is. He takes every situation for what it is at that time and works with the horse and human to make the relationship the best that it can be. Katie received her Associates Degree in Equine Science with an emphasis in Equine Teaching and Training from UW-River Falls and Dickinson State University in 2012. She has been riding for 24 years and owns a Paint gelding, Admiral, who has been with her for over 16 years. 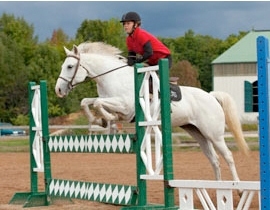 Her interests were in hunter/jumper and has gained much of her knowledge from Lakefield Farm. Admiral is now retired but she continues to enjoy light trail riding, lots of treats and each other’s company. Katie is a terrific instructor and enjoys working with children. She also runs our horsemanship weeks. When not at the stable Katie enjoys her full-time job as a vet technician for Fredonia Vet Clinic.